(Jan. 24, 2018) – Lionsbridge Football Club, the Peninsula’s new PDL soccer team that begins competition in May, announced a partnership today with Mosquito Joe, the Hampton Roads-based company that is “making outside fun again” by providing mosquito control services to residential and commercial customers. At every home Lionsbridge FC game, every kid age 14 and under will receive a free Lionsbridge FC team poster, sponsored by Mosquito Joe. Lionsbridge FC players will be available to sign autographs for kids after every game. “Eight years ago, Mosquito Joe began building from the ground up right here in Hampton Roads and they have quickly become one of the top-rated franchise businesses in the country. We are proud to be supported by a company whose incredible success story started here in our backyard,” Lionsbridge FC co-founder and chairman Mike Vest said. Mosquito Joe will receive stadium and video board visibility and digital media exposure throughout the season, including home games and the team’s pre-game community festivals. 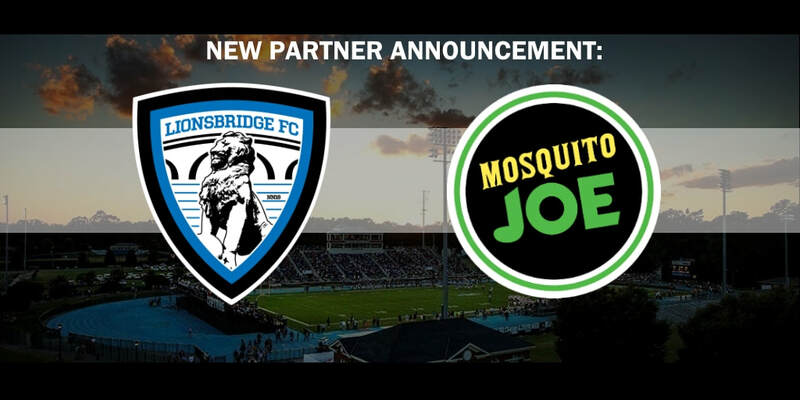 In addition, Mosquito Joe will be the presenting sponsor of one Lionsbridge FC home game in May. Fans will have the opportunity to enter a raffle to win a Mosquito Joe prize package and the first 1,000 fans at that game will receive a co-branded Mosquito Joe and Lionsbridge FC giveaway. The announcement marks the latest Lionsbridge FC partnership, a list that already includes Chick-fil-A, Riverside Regional Medical Center, Tradition Brewing Company, Christopher Newport University and Nike. Lionsbridge FC is led by co-founders and Peninsula business leaders Mike Vest, Kevin Joyce and Dan Chenoweth. Mosquito Joe of the Peninsula is owned by Robert Rummells, a retired U.S. Army Ranger and 25-year resident of Hampton Roads. Lionsbridge FC is a new team in the Premier Development League (PDL), the top pre-professional league in North America, and begins competition in May. The PDL consists of more than 70 teams across the U.S. and Canada, functioning as Major League Soccer’s primary developmental and player showcase platform. Lionsbridge FC will play its home matches at POMOCO Stadium on the campus of NCAA Division III powerhouse Christopher Newport University. Each home game will be preceded by a two-hour pre-game community festival complete with Tradition Brewing Company Sideline Lounge, food trucks, bounce houses and live music and family entertainment. Headquartered in Hampton Roads, Mosquito Joe operates in 32 states and in 2017, made the list of Top Franchises for Veterans by Entrepreneur, Inc. Magazine’s Fastest Growing Private Companies, was number one in category on Entrepreneur’s 2018 Franchise 500, landed on Franchise Business Review’s Top Franchises in the home services category and was named Best Places to Work by both Inc. and Outside Magazine.